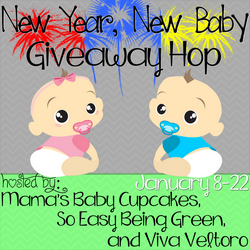 Welcome to the New Year, New Baby Giveaway Hop, hosted by Mama’s Baby Cupcakes and co-hosted by So Easy Being Green and Viva Veltoro! 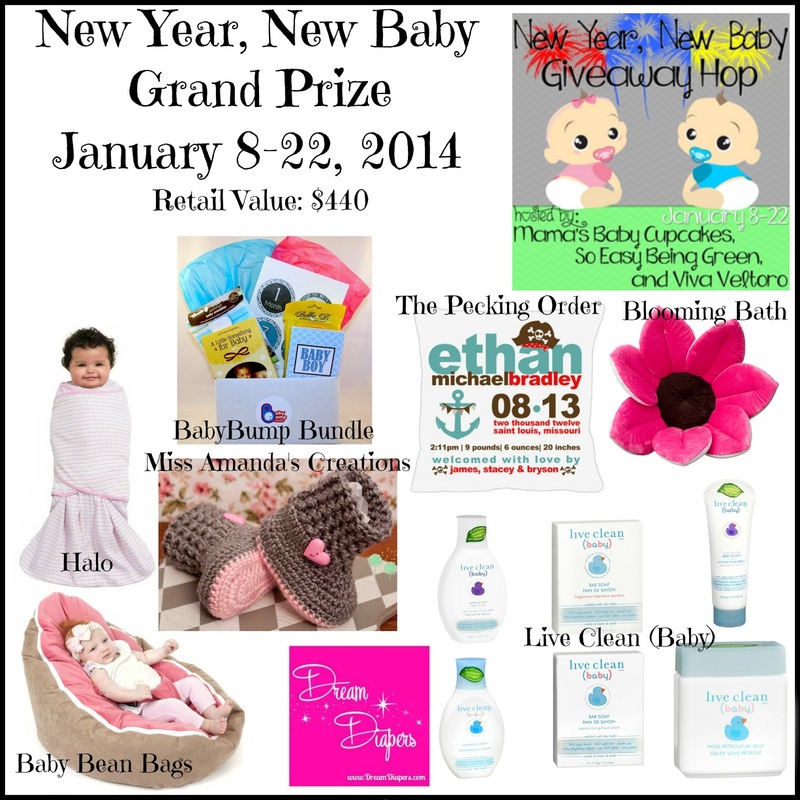 Join us in celebrating the New Year and Michelle’s new baby girl born this December, with this Giveaway Hop! This hop is focused on items you’d want/need for babies ages newborn to 1yr of age. Whether its bottles, blankets, toys, or clothes, I’m sure you’ll enjoy what the bloggers have to offer. After visiting my giveaway, you can use the linky below to hop around the other blogs! Each blog has a minimum prize package of $25 per winner. rays of bliss has partnered with Amber for Babies to offer you a chance to win their safe and natural Amber teething necklace! $30 Value! My little guy is teething and I was looking for a natural way to help soothe him. I came across Amber for Babies, Amber teething necklaces are a safe natural option and they have no side-effects! I’ve been using this adorable necklace for almost a month on my son and I love it! I was hesitant to try this at first because of safety concerns, but Amber for Babies makes each piece of jewelry by hand. Each bead is attached with two knots on either end of each bead to prevent them from scattering or falling off in the event that the chain breaks and they have a screw safety clasp. After I looked at the necklace I felt very comfortable in letting my little guy wear it. I really like that by using Amber teething necklaces I have an effective way to help relieve my baby’s pain without turning to drugs. When the amber comes in contact with the warmth of your baby’s skin, it unlocks the natural healing properties within each stone. The 100% genuine Baltic amber beads release healing oils that reduce the pain and redness caused by teething. Amber for Babies necklaces retail from $20-$30. They offer a variety of colors and bead types. Available colors: milky, multicolor, cherry, lemon, and honey. They also carry many amber bracelets/anklets too! Purchase your very own at the Amber for Babies website or their other website Baltic Amber Teething Neclaces. Win 1 Amber for Babies Teething Necklace! The giveaway will end at 11:59 pm CST on 1/22. While you’re hopping around the blogs, be sure to enter to win the Grand Prize for this Event too! A wonderful prize package worth $440 includes a SleepSack or Swaddle from Halo SleepSacks, a $75 new baby package from Baby Bump Bundles, a custom birth announcement throw pillow from The Pecking Order, winner’s choice color of bath pillow from Blooming Bath, winner’s color choice from Baby Bean Bags, winner’s color choice of boots from Miss Amanda’s Creations, the complete line of products from Live Clean (baby), and last but not least, a $50 gift card to Dream Diapers website. So many gorgeous options! I wish I had known about this with my toddler- she had a horrible teething experience. I’d love to have the Cognac Raw necklace for my next babe. I love the multicolor baroque amber teething necklace for my daughter. I would pick Lemon Olive Beads Amber Teething Necklace I like the shape of the beads. I’d get the Honey Raw Beads Amber Teething Necklace. I would pick the Multicolor Baroque Beads Amber Teething Necklace, it is so cute. I have been wanting to try out one of these necklaces for a while!! I would choose Lemon Raw! I love the Cherry Raw Amber Necklace! I love the Honey Raw Beads Amber Teething Necklace! i like the cherry colored ones! Tough choice! I do really like the Multicolor Baroque Beads Amber Teething Necklace. I have really been wanting the cherry or the black baroque teething necklace for my daughter! I really like the Milky Raw Beads Amber Teething Necklace! The multicolor Baroque beads! That’s gorgeous. Love the Multicolor Baroque Beads Amber Teething Necklace. I’d chose the lemon raw amber teething necklace! I would pick the multicolor one! Too cute! I would choose the Cognac Raw Beads Amber Teething Necklace! I would chose cognac raw beads! I would choose the Lemon Raw Beads Amber Teething Necklace.